Coming up we’ll hear one of the more important interviews we’ve ever done on the broken nature of the precious metals’ futures exchanges, and what might be the driving force that ultimately destroys the confidence in these markets, paving the way to true price discovery. 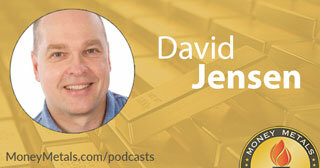 Mining analyst and precious metals expert David Jensen joins me to talk about how palladium might just be the straw that breaks the back of the paper market. Don’t miss this must-hear interview, coming up after this week’s market update. As the government shutdown persists, and a declaration of national emergency by President Donald Trump looms, financial markets are unfazed. The Dow Jones Industrials have swung approximately 500 points higher so far this week. However, the U.S. Dollar Index did hit a 3-month low on Wednesday. That helped boost oil prices in a big way. Crude climbed 10% to $53 a barrel. The price action in precious metal markets is more subdued. Gold shows a modest gain of 0.4% this week to bring spot prices to $1,291 per ounce. The yellow metal flirted with the $1,300 level last Friday. More backing and filling may be needed before the market is ready to push through that resistance. Turning to silver, the white metal currently trades at $15.68 per ounce, down 0.4% on the week. Platinum is off 1.0% to come in at $820. And finally, palladium is registering a slight weekly gain of 1.5% to trade at a lofty $1,328 an ounce as of this Friday morning recording. Metals markets don’t appear to be getting much of a boost due to investor fears over the government shutdown. So far, the standoff between Trump and Democrat leaders has been perceived by investors as more of a sideshow than a genuine threat to the economy. But the longer the shutdown drags on without a resolution, the more restless those furloughed government employees will become about the delays they face in being paid. People who are dependent on government programs such as food stamps may also start getting nervous. The government says funding could run out for some welfare programs after next month if Congress and the White House fail to come to terms on a deal to reopen the federal bureaucracy. It’s unlikely the government will actually stop paying out benefits as a result of the present political stalemate. But the risk of a default on government promises will grow in the years to come as the government’s financial condition steadily worsens. A deeply divided and polarized political system that cannot find the will or the way to compromise on a modest allocation to border fencing cannot be expected to get a handle on the rapidly growing $22 trillion national debt. The masses have been placated in recent years by a strong stock market, relatively tame inflation, and a seemingly strong economy. But the good times won’t last forever. They may even now be behind us. The Federal Reserve is concerned enough about a potential bear market in stocks and slowdown in the economy that is likely to end its rate-hiking campaign. Elsewhere in the world, the natives are growing restless. France is now on the brink of revolution. Its Yellow Vest protestors refuse to back down until unpopular French leader Emmanuel Macron steps down from power. The fractional reserve banking system is inherently vulnerable to an abnormally large scale of withdrawals. At any given time, banks are only able to pay out a fraction of what customers hold in their accounts as deposits. In effect, account balances represent nothing more than unsecured claims on banks that are technically insolvent. In a financial crisis, the banking system could become functionally insolvent – meaning customers would be unable to withdraw funds. They might even find themselves in the position of having to “bail in” failing banks by taking losses on their accounts. This happened a few years ago during the financial panic that hit Cyprus. Cypriot account holders learned a tough lesson in counterparty risk. Investors can mitigate that risk by holding assets outside of the banking system and not depending on promises from bankers, brokers, or politicians. Assets that entail zero counterparty risk include physical gold and silver bullion products that you can hold in your hand and own free and clear. Coming up now… our discussion on another type of fractional reserve system, that being the metals futures markets. Yes, it’s looking like the futures markets are losing some control over the pricing of the metals. So, let’s get right to this week’s exclusive interview. Mike Gleason: It is my privilege now to welcome in David Jensen of Jensen Strategic, a highly-studied mining analyst in precious metals expert with close to two decades of experience in the mining industry, and it’s great to have him on. David, thanks so much for the time today and nice to finally talk to you. David Jensen: My pleasure, Mike. It’s good to touch base with you. Mike Gleason: Well, David, you’ve been closely following the palladium market, and that’s where I wanted to focus much of our conversation today, because that’s obviously where most of the fireworks are happening in the metals these days. Now, for the most part over the last few years, gold and silver prices have been bouncing around and have been basically in trading ranges. But palladium has been a different story, however. The metal has been climbing steadily for most of the past three years. Things got off to a rough start in 2018, but since the middle of August, prices have rallied more than 30% and we’re back to all-time highs. You have been watching the palladium market closely and you have some important insights. So, let’s get started by talking a little bit about palladium supply. You have some background in mining and metals. Can you first talk, briefly, about where palladium is produced and why supply could become a serious issue? David Jensen: Yeah, sure. The world palladium market globally is about, in round numbers, about ten million ounces a year. And of that, about eight and half million ounces comes from mine supply and recycling. And then if you drill it down a little bit more, it’s about six and a half million that comes directly from mine supply versus the ten million ounce total consumption. And of that six and a half million ounces, about 40% comes from Russia and about another 40% comes from South Africa. And then the other nations, Canada, the United States and other places fill out the last 20%. So it’s a very concentrated supply from two primary sources. Mike Gleason: The market for palladium is relatively tiny compared to gold and silver, as you just laid out. But what’s happening there could have major implications for precious metals markets generally. The bullion banks have a bad habit of selling vast amounts of paper metal that will essentially create fresh new contracts for any buyer who shows up wanting one, sopping almost any amount of demand without prices being forced higher, as many would expect. They never seem to get called on it, but the bullion markets are essentially fractional reserve, and the fraction of physical metal backing all of this paper seems to just keep diminishing. However, the palladium market may represent a serious problem for the bullion banks. If you would, explain what a palladium lease is, what sorts of people or institutions lease metal, and why. David Jensen: Okay. Well, the leasing of metal is typically a stop-gap measure to secure physical metal if you can’t get it from a refinery or from a mining supply source. So, it’s usually a stop-gap measure. And we’ve seen that leasing cost … and by the way, the leasing rate is a percentage and has to be paid with metal, not with fiat money or paper money at the end of the lease. And because you have to store and insure precious metals, typically when the market is flush, you see a negative rate so that the holders of the metal are actually paying you to take the metal off their hands. And what we’ve seen now is, over the last, oh about 18 months, is that the palladium has gone from a negative lease rate. It spiked a couple of weeks ago to about 30% for a one month lease. And it’s around 21% today. So, what that signals to us: it signals that you can’t get adequate physical metal in the market right now and that there’s a dearth of supply. Now, that shortage has not been quick to arise. The CEO of Johnson Matthey, which is one of the world’s largest refiners of Platinum Group Metals, he warned the market in 2017. He said that there had been a decade of ingrained or structural deficit where they had burnt down the above ground inventories through a supply deficit. And he said that the stockpiles are not all gone now, but if we continue along this path, that they certainly will be. And sure enough, now we see these very, very large lease rates signaling that there’s a real problem with supply. And the shortage Mike, it can’t be addressed very quickly. It takes a decade from expiration through development into production for a mine, typically. What we’ve had is several decades of pricing metal in London, which is the primary pricing market for precious metals for the miners. They have been using these unallocated contracts, which is really trading promissory notes, between the bullion banks to set the price on a daily level. So, what happens is, you don’t have to have the metal to trade it. And the trading has been dominated by these bullion banks who have been able to really just set the price where they wish. But the problem is that they’ve set the price too low, which happens … and this is really a form of central planning when these interventions (take place) … and, what you have then is you have a systematic over-consumption and under-production of the metal when the price is set too low. So, where we’re at right now, it’s a situation which has developed over decades. There’s no quick solution. And palladium with the smallest above-ground inventories, is the first to signal a problem. But really, we can see a very quick change in the market for platinum, silver, and gold as well because of the similar, let’s call it leveraged positions or leveraged trading, which goes on in the market, that you have unallocated contracts with no metal behind them. And the holders of these contracts, many of them are commercial users for silver and platinum as well, especially. And with palladium, 80% of the consumption is for catalytic converters in automobiles, you can’t use the contracts in these catalytic converters. So, those who need the metal are saying we want metal, give us metal now. And that really takes away or binds the hands of these bullion banks who have been really trading just the paper promissory notes. So I’m expecting a contagion to happen into silver and into platinum, initially. And ultimately, into gold. Gold has the largest above-ground inventories relative to annual demand. But it’s still very tightly held. Mike Gleason: If you don’t mind, tell our listeners what the term backwardation means in the metals markets. David Jensen: Yeah. Backwardation structure is where the spot market has a higher price than the forward or the future price. The opposite of that is called contango, where the future price is a higher price and it reflects the cost. If you buy a contract in the futures market, it reflects partially the cost of storage and insuring the material for that period of time. And, when you have a backwardation structure, what that means is that the demand is so high in the spot market for immediate delivery that it overwhelms those forward held costs. And it really signals that there’s so little metal in the market that those who have the metal are not able to meet the need with a guaranteed profit in fiat dollars. If you sell spot and buy a future contract, you’re notionally guaranteed to get the metal back or have a high likelihood of getting the metal back. And you should be able to net a very handy profit in a very short period of time. So, when you see these sustained backwardations, as you’re seeing in palladium, it’s really a further signal of the problem in the market that even offering a guaranteed profit that you can’t source enough metal to drive that metal price structure back into the normal contango, where the future price is higher than the spot or immediate delivery market. Mike Gleason: If we see defaults on delivery in palladium, what do you think the ramifications will be for gold and silver? Will all of these apathetic traders make the connection between what’s happening there and what could happen in gold and silver? And will regulators wake up and take action? How would you guess this will play out? David Jensen: Well, I think, Mike, the potential is there for a knock on or a contagion effect into the markets. The LBMA … and I’m still very skeptical of the LBMA given that it was created by the Bank of England in 1987 and that ever since, for multiple decades during that period, we’ve seen from the work of Dmitri Speck, that the price has been drilled down at the Fixes that occur each day, the A.M. and the P.M. Fix. So, I mean, in London, they claim that there’s about 1.7 billion ounces of silver positions in the various contract forms. And, the industrial users of silver also, just like the catalytic converter manufacturers (who buy physical palladium), can’t use these unallocated contracts in their industrial processes. They actually need physical metal. So, what I see happening here is that palladium is drawing attention in the market to the problem, really, the mal-structuring in the market after decades of price suppression using unallocated contracts. And I see the potential here with that large number of positions in the silver market, especially. We don’t know what it is in platinum, they don’t release the numbers. But I certainly see the potential here for silver and have an outsized move. As those who need the metal say, “We would like to have delivery now to ensure the supply, given that we can see in the palladium market, the signal of the problem of these unallocated contracts.” And leverage in silver, gold, and platinum is there as well. You only need a small percentage of the holders to really cause an outsized move in the market. Mike Gleason: Yeah. As people need to remember, palladium and silver as well, there’s a huge amount of industrial users for these metals. That’s really what those metals are for primarily. Especially palladium. And as we saw, I think it was back in 2000, where the automotive manufacturers were worried about getting that physical supply out of Russia, and they started hoarding the metal and the price of palladium spiked as a result. You think that sort of thing could happen if some of these industrial users start to worry about what’s going to happen if I can’t get the physical metal for raw material, then I can’t make my products. They’re not going to be putting themselves in that position. They’re going to get that metal at whatever cost it takes; right? David Jensen: Yeah. It’s usually a relatively small percentage of the cost of manufactured goods is represented by these precious metals. And I think that as prudent supply chain managers look at these situations and say, you know, we’re seeing problems with unallocated contracts. The signal has been sent and we do not want to be in a position where we are unable to ship goods because of a cost component with representing a small percentage of the actual finished price where we can’t secure these small elements and are thus bound. I mean, cell phone manufacturers come to mind, and others. Solar panels and electronics. And so I really see this starting to spread, the awareness spreading in the market to the point where you get away from just in time delivery and holding of relatively large spot contracts and it gets reflected into more of a secure holding of several months of supply to ensure that you’ve got continuity of material flows. Because of the leverage in the market, as I alluded to earlier, I really see that that can have an outside impact where you’ve got many more claims in the market than you actually have metal. So you need a small number of these claim holders to convert to physical metal to start to see a disorderly market or a disrupted market take effect. Mike Gleason: Yeah. Shortages beget more shortages, as they always say. And it could be just a frenzy as people try to get their hands on it. Now, we talked about broken markets here when it comes to these futures exchanges. Getting back to, say, a dozen years ago, we had, obviously, the financial crisis of 2008, 2009. And you sounded the alarm before all that began. Talk about that, and then I want to kind of relate it to today and maybe get your thoughts on how, maybe what we’re seeing right now with a lot of uncertainty, a lot of gyrations and volatility in the stock markets, and how that could potentially set up for maybe the next financial collapse. Give us a little bit of your insights on that, if you would. David Jensen: Sure. In 2007, I reconnected with the Governor of the Bank of Canada, David Dodge, who had been a former lecturer at my university when I was doing my MBA in 1998 and ’99. And, I had talked to him. He had just given a speech here at the Vancouver Board of Trade in Vancouver and said that the disruptions that we saw in the asset backed commercial paper market was just a signal of an adjustment of risks and that things would be fine. I had a totally different view. I viewed the systematic suppression of precious metals. And it might sound like an obscure concept to listeners, but when you look at the fact that in 1980, they had to raise interest rates to 9% above the inflation rate to get people out of gold, which had run from $45 in 1970 to $850 in 1980. They had to raise interest rates to 9% above the inflation rate, which was running 10%. So 19% at that time. Thereafter, the Central Bank, the Bank of England, created the LBMA trading paper substitute for gold. And I mentioned this to him afterwards. And he said, I don’t have time to get into this in great detail, but here’s my card and please forward me the information. So, I sent him two letters that are now posted on SafeHaven.com. You can look at my letters to David Dodge. But the view was that we had entered into this market where we had basically shut off the warning system for inflationary monetary policy, which is gold. It warns people when they’re printing too much money, as we saw in 1980, and that we had really blown a succession of bubbles in the financial markets, which would come unwound. And what we’ve seen since that crash ten years ago, the Great Financial Crisis, as they call it, has been more leveraged, more than $70 trillion of more debt around the world. And they solved what was a debt problem caused by the suppression of precious metals and the printing of money to more printing of money. It really goes unabated now. And, I don’t see a good end to this, Mike. The Fed is really choking off liquidity in the markets and we’re heading to another crisis now. And I think that this next crisis there’s going to be really a hamstrung ability of the central banks to lower interest rates further and to run the zero interest rate policies. When the markets see that kind of behavior, I think it’s going to spike a panic in the market, or fear that they’ve tried to solve a debt problem with more debt and here they go again. And it’s very visible this time, I think, to people that the Green Shoots, as Ben Bernanke was really deceptively telling people about, are nonexistent, and that you can’t solve a debt problem with a debt problem. And I think at that point, we’re going to have a serious problem. We’re going to have to write down the debt and restructure, I think, our monetary system as well, which really points its finger back at gold and silver, which are historical monetary instruments with a four-thousand-year history as money. Mike Gleason: Well, finally, David, as we begin to wrap up, what kind of year do you envision it will be for metals in 2019? Might it finally be one where we see them truly act as a safe haven asset class that sees the masses flock toward it to protect themselves? Or is that day still a ways off? Basically, how do you see 2019 shaping up for metals investors and metals prices? David Jensen: Well, I think if you take a long view and look at metals, they’ve risen from 250 U.S. dollars an ounce gold in the year 2000 to the $1,300 level now. And I know that is lower than the $1,900 dollars we saw (seven) years ago. But I do think that they have performed somewhat, even though the performance has been muted even with the trading of these unallocated contracts. But I do see a year ahead of us here due to the leverage in the markets, due to the really chronic underproduction, over consumption of the precious metals due to the mal-pricing by the bullion banks. We’re now at the point, now, where it’s very difficult to hide these problems, Mike. So, I really see this year here as being a hinge point, an inflection point for these markets. And I think that we’re going to see the physical market start to really assert itself. I think we’re already seeing it in palladium. There are indications now that platinum, the lease rate is starting to creep up. And the knock on, I think, to silver is going to accelerate the process. So, I do think that we’re in a position now where, really, I don’t see these as investments. I see them as insurance policies and I see them as monetary instruments. And I think that, really, the deception of central banking and the concept that you can create wealth by creating more debt, that you can create real organic wealth by printing money and creating debt is going to be shown the fallacy that it is. So, I feel very strongly about the physical metals having a positive turn here. And I think it’s really rooted or anchored in what we’re seeing in the palladium market and that the limits are clearly being reached in this market. We’ve had more than 18 months now of increasingly high lease rates on the metal. And I don’t think this is a problem that’s going to go away. I think we’re going to see an accelerated demand for palladium now as people realize the problems. And then, ultimately, it’ll terminate the paper pricing system that we have in London and New York. Mike Gleason: Very well put. And that’s exactly why we wanted to have you on here today and talk more about this palladium story. Because it might seem like a little obscure metal to a lot of folks, but it can have some major implications on these other markets, the bigger markets, gold and silver namely. And I t was great to discuss that with you. I hope we can talk to you again as this all unfolds. I really enjoyed it. All the best to you in 2019. Thanks so much for your time, David. David Jensen: Best to you, Mike. And thank you for your time. Mike Gleason: Well, that will do it for this week. Thanks again to David Jensen of Jensen Strategic. You can follow David on Twitter @RealDavidJensen, be sure to check that out.